The WooCommerce Integration - How does it work, and how do I set it up? – How can we help? The WooCommerce Integration - How does it work, and how do I set it up? Note: The WooCommerce integration is currently in Beta and will be available to retailers on our latest Pro and Enterprise plans. For more information click here. Important: For Vend users the WooCommerce integration is only available on the Pro or Enterprise plan of our latest pricing plans, If you are on the Lite plan, you will need to upgrade your pricing plan to connect your Vend store to WooCommerce. Before connecting your WooCommerce store to Vend, we recommend connecting your store to a test environment. Creating a test environment enables you to test the new integration thoroughly before integrating your live store and will cause the least disruption to your store and your customers. Work with a Developer: WooCommerce runs differently depending on which server you host it on, and how you set it up. Engaging with a developer will help you get properly set up. Allocate enough time: We recommend setting aside time to set up and test your site before going live to your customers. The timing can vary depending on how your WooCommerce store has been set up. We also recommend that you read our Help Article - Things to check before integrating WooCommerce with Vend. This will ensure that you have everything prepared before setting up the integration. We recommend setting up a new register in Vend in the outlet you want to link to WooCommerce. This is because sales made in WooCommerce after you close your store’s register for the day will re-open the register. Setting up a separate register ensures all your reporting is clear. Make sure you have set up all the products you need before activating the integration. When you first turn it on, you'll have an option to push all your products to WooCommerce. After this point, you'll need to publish them one-by-one. Once the two stores are linked, you must manage all of your products in Vend. The Vend-WooCommerce integration shares product, inventory, customer and sales information between both systems, simplifying daily operations by saving time on manual admin and double-entry. Everything is kept up-to-date between your online and brick-and-mortar stores, so you can be confident that you will only sell stock you have. If you are new to selling online, WooCommerce is a great option as you can start with the essentials using their free WordPress plugin, and add more features and extensions when you want to build up and grow your online store. If you already have a WooCommerce account, once you have set up the Vend integration, you will be able to manage sales, inventory, and reporting all from one place. Important: You will need to be on WordPress 4.4 and above and WooCommerce 3.0 and above to be able to integrate your Vend store with WooCommerce. You can think of the WooCommerce integration as an extra shop window for your entire store. After connecting your WooCommerce and Vend store, you will have the option to link your WooCommerce store to one or more of your Vend outlets. By doing so, you can pick which of that outlet's inventory are shown online, and WooCommerce will display available inventory levels from the linked outlet. When a customer makes a purchase in your store, or you complete a stock order, transfer, or stocktake, the sale will be recorded on the register selected for the WooCommerce integration in Vend, your inventory levels will be updated, and this will be updated in your WooCommerce store. Important: Integrating other apps, such as inventory managers, with your WooCommerce store may cause problems. Please test this thoroughly through a before switching on another integration to your WooCommerce store when linked with Vend. Any third party integration that changes your prices and SKUs will cause problems. The Vend-WooCommerce integration sets up a 1-way sync scenario. 1. WooCommerce is empty, no products. 2. Your Vend store is full of many products. 3. Vend will fill WooCommerce with products. See Add and Link Products below. 4. WooCommerce sells products and feeds inventory changes back to Vend. 5. Product management is done in Vend for all values that are synced by the integration: Price, images etc. while WooCommerce provides the beautiful storefront. This is what defines a 1-way sync integration using this extension to sync Vend with your WooCommerce store: Vend overrules/manages WooCommerce product inventory while WooCommerce feeds selected info (sales, inventory) back to it. Due to the fact that Vend is the deciding factor in this system, we call Vend the Source of Truth. There are three main steps you will need to complete prior to setting up your Vend-WooCommerce online store if you are new to WooCommerce. 1.Set up your Wordpress Account. 2.Set up a hosting provider. 3.Set up a WooCommerce account. The first step to setting up your Vend-WooCommerce online store is to set up a Wordpress account. As WooCommerce is a plugin of WordPress, you will first need a Wordpress account before you are able to take further steps. The next step to setting up your Vend-WooCommerce online store is to select a hosting provider. This will enable you to start building your online store with just a few clicks. As WooCommerce is a plugin of WordPress, you will need a hosting provider who will host the Wordpress website on their web servers, leaving you to focus on building your online store, versus, maintaining a web server. There are two options when selecting a hosting partner. 1.Run your WooCommerce site directly from WordPress. As WordPress is a hosting provider itself if you use the Wordpress Business Plan this will include everything needed for you to run your WooCommerce store. Using the Wordpress Business Plan can cost extra, but will take you less time to set up your store up so you can get up and running faster. 2.Use a separate hosting provider to run your WooCommerce store. WooCommerce has partnered with a few hosting providers that offer pre-installs of WordPress, WooCommerce, the Storefront theme and ecommerce-specific features, such as a dedicated IP and SSL certificate to keep your store protected and secure. For more information on hosting providers, check out this article. Using a separate hosting provider is a much cheaper alternative to the Wordpress Business Plan. However, there will be some extra steps required to set up your store. Once you have set up your hosting, you will need to set up your WooCommerce account. Head to this website to get set up. Once you have set up your hosting, WordPress and WooCommerce account, you are ready to set up your integration with Vend. 1. In Vend, open the Setup page, and click Add-ons. 2. Find the WooCommerce add-on and click Connect to Vend. 3. This will take you to the Connect to WooCommerce page. Click on I don't have a WooCommerce account. 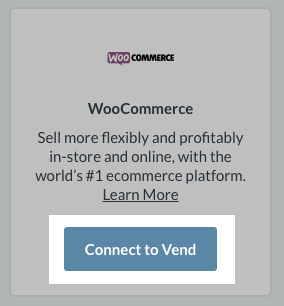 Click Find out more if you would like to learn more about using WooCommerce with Vend. This will take you to a new page where you will be able to learn more about the integration. Once you have set up your hosting, WordPress and WooCommerce account, you are ready to set up your integration with Vend. Click here to set up your Vend-WooCommerce integration. Important: You will need your store URL and your login credentials to set up the Vend-WooCommerce Integration. We recommend you take a back-up of any product data in either system before you begin. You can export your Vend products on the Product page and you can export your WooCommerce products on their Product page. 3. This will take you to the Connect to WooCommerce page. Click on the I have a WooCommerce account. option and you will be able to start entering your WooCommerce store details. 4. Enter your WooCommerce store URL. The URL will have to be secured, i.e., https and if you have your domain (e.g. mystore.com) make sure you tell us your WooCommerce domain (e.g. mystore.woo.com). 5. Enter in your Consumer Key and Consumer Secret. If you need to obtain your Consumer Key and Consumer Secret, head to your WooCommerce website. Note: The API Key is linked to the user who created it. Deleting the user who created the API Key will remove it and the integration will break. In the event where you may need to delete the user who created the API key, assign the API key to another Admin user before proceeding to delete. This will provide you with your Consumer Key and Consumer Secret. For more information, head to this article. Once you have your Consumer Key and Consumer Secret, copy and paste the values into the fields in Vend. 6. You will then need to create a permalink under Wordpress. This is because your account must have a custom permalink enabled with any of the tags added to it. For more information on what a custom permalink is, check out our WooCommerce FAQ article. 7. Choose one or more outlets to sync your inventory with WooCommerce. 8. Select a WooCommerce register. We recommend that you add the new WooCommerce register that you may have created before you began. This will help you track your online sales separately from your in-store sales. 9. Select a payment type. Any payments processed in WooCommerce will be recorded as this payment type in Vend. This could be your regular credit card type, or you might like to set up a separate payment type just for WooCommerce payments. Important: Vend gift cards do not work with WooCommerce. Important: If you receive error messages when setting your integration up, check out our Troubleshooting your Vend-WooCommerce Integration article for further assistance. You will now be able to pick how you set up your products. 1. If ALL your products are in Vend, and you want them ALL in WooCommerce, head to your Product page in Vend and click Publish All Products. 2. If ALL your products are in WooCommerce (existing WooCommerce user), click Import All Products. Note: Any pictures attached to these WooCommerce products will not be carried across to Vend. Draft Products: If you have any products in Draft stage in WooCommerce, these will NOT get imported into Vend from your WooCommerce store. 3. If you only want to publish SOME of your Vend products to WooCommerce, you may publish a product individually by heading to the product detail page and selecting Publish to WooCommerce. 4. If you have products in BOTH systems, check out this article. 1.Create the product in Vend. 2. Find the product on the product page in Vend. Select it and click the Publish to WooCommerce button. 3. Add beautiful images and other details needed for online sales, such as weight, in WooCommerce. Stock Tracking Off - N/A, On - On, product only sold when inventory > 0. When publishing your product to Vend, we'll also publish all the images you have in Vend to WooCommerce. If you decide to add new images to a product at a later stage, these images will overwrite the images you have in Woo. Note: If you were unable to publish your images to WooCommerce due to an error. Please check out our article Troubleshooting your Vend-WooCommerce Integration for further assistance. Composite products will display as an individual product in WooCommerce, with the information matched to the composite product in Vend, rather than the component items. Sales of a composite product in WooCommerce will still update the inventory of those items in Vend. Variant products will display as a single product in WooCommerce, with drop-down menus to select your different variant options on the product's page. This means that you won't be able to display each product in your WooCommerce store separately. If a product is set up as a variant in Vend, all versions of the variant will be sent to WooCommerce. You cannot publish a selection of the versions of the variant to your WooCommerce store. If you want to display each product individually, you'll need to set them up as separate products in your Vend store. Once you have linked your products in both WooCommerce and Vend, apart from the exceptions below, your product will always be updated. All other fields (name, price, tags, description, quantity etc. ), including new variants to a product, should be edited in Vend when you make updates to your product. When you edit a product in Vend, WooCommerce will be updated when you save the changes. Sometimes, updates take a while to process. If the update does not publish after 1 hour, contact our Support Team. If you need to update a large volume of products, you can complete this via CSV import. Important: If you make any changes to a hidden product in Vend, it should be made visible again in WooCommerce. You can toggle the visibility of a product in Vend if you do not wish to display it in WooCommerce. This can be useful if a product is seasonal, or you no longer sell the product currently but may sell it again at some point in the future. 1. Navigate to the Products screen in Vend and find the product you wish to disable. 3. Once on the Edit Product screen, under the Product Type field, click on the green toggle for Sell on Point-of-Sale. This will turn the toggle grey and will disable the product in both Vend and WooCommerce. It will no longer be accessible on your WooCommerce store or the Vend Sell screen. However, it does not break the link between the product in Vend and WooCommerce, so any updates made to the product in Vend will still carry across to the product in WooCommerce. To confirm that this has worked you can click the View on WooCommerce button on the product page. I want to delete the product from my Vend store AND my WooCommerce store. To delete the product in both your Vend and WooCommerce store, always delete the product in Vend. Click on Delete Product on the product detail page of the product. This will update your WooCommerce store. Do NOT manually delete the product in WooCommerce. I only want to delete the product from my WooCommerce store. You may not want to delete a product from your Vend store, as you can report on the deleted product. This is useful for items you no longer have in inventory, and will not be reordering. Important: This does not apply to products with variants. You must delete the variant in Vend to remove it from WooCommerce. 1. In Vend, head to the Product page. 2. Click on the product you wish to delete. This will take you to the product detail page. 3. Click the Unpublish button. This will break the link with WooCommerce. The item will continue to appear on your WooCommerce store at this stage, therefore you will need to delete the item from your WooCommerce store. Complete an order, transfer, or stocktake in the Vend outlet(s) linked to your WooCommerce store. When the order (transfer or stocktake) is completed in Vend, the changes will be updated in your WooCommerce store. Note: If you have a large number of products, especially during your stocktake, any changes may take some time to update in your WooCommerce store. A customer completes a sale (order) in your store. The sale and payments are recorded in the linked outlet on the register you have selected. The closed sale reduces the inventory level for that outlet. The order will be recorded. An email will be sent to the customer confirming the sale. You need to fulfil the order on the WooCommerce order fulfilment page. The order fulfilment will send a shipping confirmation to the customer. Note: Orders are received by Vend when they are in Processing status on WooCommerce, to ensure inventory at the time. For BACS, direct bank transfer and cash on delivery, Vend will receive the order when the order is On Hold. You will need to follow the steps here to add payment to the order to complete it. When a sale comes through to Vend from your WooCommerce store, we'll create a Shipping Charges product. Each WooCommerce order with shipping charges will have this product, with your shipping charge amount, added to the sale. This means you can also report on the total amount of shipping charges using the Product reports in Vend. If you accept payments made via bank deposit, the sale from WooCommerce will be sent to Vend at the time the order is made. The sale balance will show as unpaid. When the customer pays you, you will need to record the payment and fulfil the order in WooCommerce and record the payment in Vend. Updating the sale in WooCommerce WILL NOT update the sale in Vend. Your register MUST be open when you apply the payment. Locate the sale in the Sales Ledger. Click the Apply Payment link. Select the payment type, today's date, and the current time. The current time MUST be after the register was opened, and before the register was closed, or your payment will not appear in your register closure reporting. By default, sales and inventory in WooCommerce will be updated to your Vend store. Although your sales in WooCommerce will be added to your Vend store, if you need to add sales to your Vend store manually, use either the Import All Orders or Import All Open Orders button. Once you've saved the settings, you will be ready to go in Vend. Do not unlink and re-link your stores unless you are planning on deleting all items from your WooCommerce store and starting from scratch. When the sale from WooCommerce comes through to Vend, the inventory will be deducted for all the products sold on WooCommerce. If you would like to link your WooCommerce account to the Facebook page of your business, check out this article.